Regarding today's Garfield comic strip , it was written almost a year ago and I had no idea when writing it that it would appear today -- of all days. 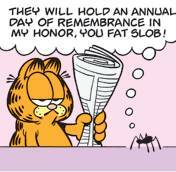 I do not use a calendar that lists holidays and other notable days so when this strip was put in the queue, I had no idea it would run on Veterans Day. What are the odds? You can bet I'll have a calendar that lists everything by my side in the future. My brother Dave served in Vietnam. My son James is a Marine who has had two tours of duty, both in Iraq and Afghanistan. You'd have to go a long way to find someone who was more proud and grateful for what our Veterans have done for all of us. Please accept my apologies for any offense today's Garfield may have created. It was unintentional and regrettable. Of secondary interest might be that Davis has the strip written almost a year ahead, which isn't a common thing anymore but seems perfectly suited to his gag-heavy strip.